Eric Bloom, lead singer and guitar player for Blue Oyster Cult (but you knew that), posts photos of some of his favorite guitars and tour t-shirts. Yes, the creepy logo-shaped guitar is featured. There are two of them! Not-to-be-believed Blue Oyster Cult trivia: Michael Bolton opened for B.O.C. 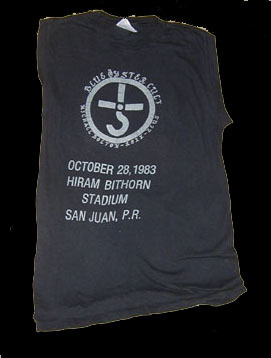 in Puerto Rico’s Hiram Bithorn Stadium in 1983. I see that you do not believe me. Do not take my word for it, behold the shocking evidence of this unholy union for yourself. Las señoras, encienden tus motores! Men, I went there also. I’m from the island and was amazing. Congrats. I used to keep my half ticket. But I lost them all and my concert pics. But better than that I have the memories. I was at that concert. I was in the Navy, stationed at Roosevelt Roads. BOC was great, don’t remember much of Bolton. I tell people I saw him open for BOC, and they don’t believe me.